Part one: The entire west coast has light wind as the North Pacific High abandons the eastern Pacific. 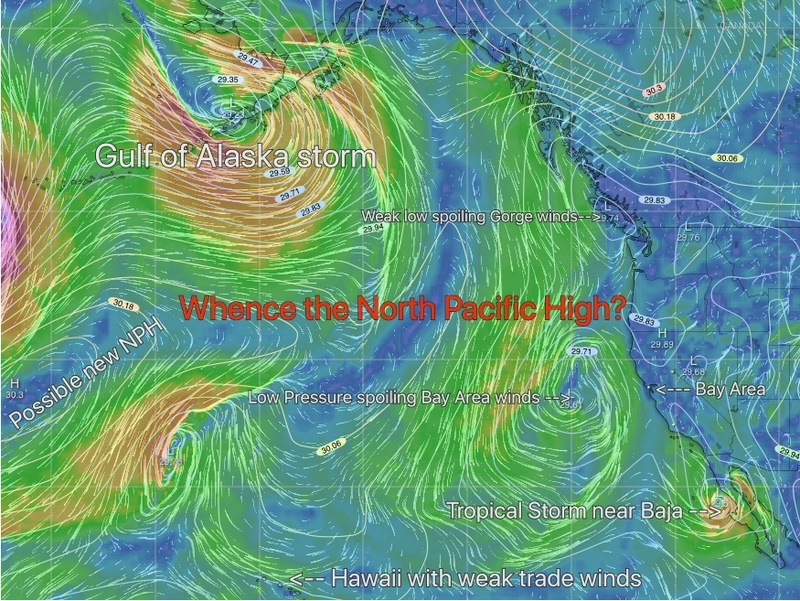 The elephant missing from the room is the North Pacific High. Most of the summer this clockwise Spiraling mass of wind lorded over the entire eastern Pacific. Yesterday it was absent. Now notice the weak low pressure off the Gorge. This played a role in the recent E. winds. Then check out the stronger surface low-pressure west of the Bay Area that delivered weak southerly wind to the Bay Area. Next notice the huge storm in the Gulf of Alaska. Lastly notice the tiny new North Pacific High way NW of Hawaii. In part 2 of this blog we will watch that new North Pacific High grow and move towards the west coast.